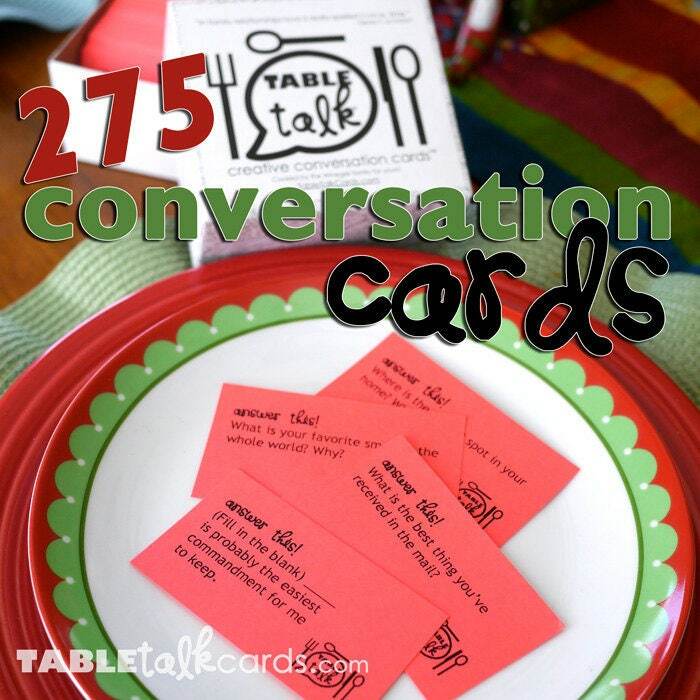 Box of 275 TableTalk Creative Conversation Cards which will add flare & depth to your everyday conversations or gatherings with the people you love most. No rules, just grab a card and ask away to unlock those unique conversations and reminiscing moments. ♥Connect with family members and ask questions like: "What is one thing your family has done to make you feel special on your Birthday?" or ask, "Who sneezes the most times?" ♥Having a dinner party? You can pick one original card and put it before each diner's plate. Then learn about guests by asking questions such as "What's the worst thing you've made in the kitchen?" or "What’s the most spontaneous thing you’ve ever done?" ♥Teens get ready to talk to friends or first dates with questions like: "If you had to watch the same movie every Friday night, which movie would you choose?" or "If you were in charge of the family Christmas party what music would you play?" ♥Mormons (members of The Church of Jesus Christ of Latter-day Saints, aka LDS) can learn a bit more about each other's testimonies by asking faith based questions like: "What Old Testament prophet or apostle would you have liked to be?" or "What's your favorite miracle performed by Jesus Christ? Why?" Why a Box instead of a Jar? We started with a jar and quickly realized the need for a box. When you're done with the card, just conveniently tuck the card behind the other cards in the back of the box and keep on going, you won't get a repeat until you've asked all 275! It's just easier and faster which makes it more fun! Plus, you'd need a pretty huge jar to fit this many questions on your table. Each box is packed with a slue of questions sure to entertain everyone at the table! Questions are collated together to create a well rounded set of conversations throughout the year. For 2 or more players, great for all ages, basically anyone who can read and communicate. ;) BTW Our 2yr old loves answering these questions too or play a solo game and jot the answer down in your journal. ♥These Cards make great LDS gifts, wedding gift, birthday gift, journal prompts, and perfect for Family Reunions or any social gathering. I love Jesus Christ, so I’ll remember Him with a sale! Use code: HEISRISEN2019 - Exp: April 26, 2019. Love this idea! Great item. Loved this idea! Fast shipping! Quick shipping! Absolutely loved the personal touch, and quality to cards! YES, however 99% of all of my products are digital JPG files, you can receive or have access to download your file(s) anywhere in the world!! If you order a physical product you will see the price on the product page. Also, Table Talk Creative Conversation Cards are only shipped within the Continental U.S. YES! Let me explain. Printable files are processed ASAP. I'll send you a text (provided you gave me your number) as soon as I have reviewed your order. Then when I start working on it, I'll send you a sample proof of your project so I can be sure I am delivering on how you want your desired order. The high res 'ready to print' JPG file will be emailed after you have OK-ed the image sent via text/email after I have customized the details for you. If it looks great and you don't call, text or email me back within 24hours I will know, it's perfect for you, texting saves us both time. I will provide my cell number to call or text, if additional revisions are needed for misspellings, dates and things and I can get it back to you ASAP. 4x6 inches = 10.16 x 15.24 centimeters. 5x7 inches = 12.7x17.78 centimeters. How do I print my JPGs? You can print your JPG image file(s), at a photo lab (like Costco or Walmart) or you can also save it to your phone and email/text it to your fam, friends or guests. Post it on social media too. Depending on your order, I include high resolution JPG file(s) in either 4x6 or 5x7 size. Printing your JPG file(s) at home or at a print shop (like FedEx Office or CopyTec, etc...), is simple. Print in color on cardstock at 100% size or you can even tell your printer to fit 2 on 1 page & then cut them out. Printing multiple on one page can save you time and money! UNCHECK "Print to Fit" option because it will enlarge your invite to the full size of your paper in your printer, but you want to keep it at 100% in order to stay at the 4x6 or 5x7. Where can I print this JPG file ASAP? Want it in 1 hour! My favorite places are either Walmart Photo Center or Costco Photo Center, but any photo center w/ 1 hour printing will be perfect for when you need them, just make sure they are open when you will be needing to pick them up. I love Walmart because the photo center here in my neighborhood is open until 9pm! How fast is your RUSH service? If you’re like me and like to sweat as your planning parties, and you need your file ASAP, SAMEDAY or even YESTERDAY! please choose the RUSH option in the drop down menu. Your proof will be sent first within a few hours (please text me your number to answer all questions prior to designing your product) and if you're able to get back to me quickly after a proof has been sent, you could have your file within 24 hours, and if I’m already on my computer, even faster! Look for my cell phone number in the order confirmation email, and text me, so I can text you back if I have any questions about your invite as I'm working on it and get it to you ASAP. Also, our Table Talk Creative Conversation Cards are shipped via USPS Priority Mail in the USA. What's Corjl & why are you now using it? I am slowly transitioning designs I edit and personalize myself to an online based service called Corjl. This will allow my clients the ability to edit their purchased designs themselves without having to wait for me to get back with them. It's like turning all of my Personalized Designs to Instant Downloadable RUSH Designs because you can literally edit the design in the same amount of time it would take you to type up the info you need on the invite to send to me. Corjl will save you time & money! - Be sure to always read the directions before purchasing because you can demo any design before purchasing.